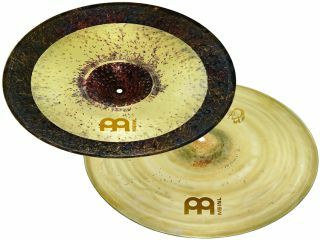 PRESS RELEASE: Meinl is introducing the newly developed Benny Greb Signature 20" Sandride in its Byzance range of cymbals. It features two different surface treatments on top and bottom: A sandblasted top combined with a partially lathed bottom produces a dry sound with a fast articulate stick sound and quick decay. The bell has a clear and bright voice. "It has been a big challenge for us to develop a ride cymbal with which Benny is totally happy and satisfied," explains Norbert Saemann, Meinl's International Director of Artist Relations. "The whole R&D process took nearly one year. We are very proud with the result and are confident that the sound of the Sandride will please a lot of drummers worldwide." Benny Greb comments on his signature ride cymbal: "My expectations for a ride cymbal are very high. Until recently, I was going back and forth changing models all the time within different projects and styles. Sometimes I even used two different rides in my setup." "For me, the ride is the most important cymbal in my drum kit. It has to have character. It defines the overall sound of the drummer and the whole band immensely." "I always loved the shimmering but transparent stick sound of lighter cymbals and also their ability to be crashed. But then I missed a great sounding clear bell that wasn't too washy, that was more likely to be found in heavier models. And I like my ride to sound, fell, and look like it has been played for 30 years." "With the Sandride I have now found the cymbal that combines all of my expectations into one fantastic ride with a lot of character. It has the beautiful light wash and stick sound of a thinner cymbal and the clear bell of a heavier cymbal." "It has been aged through a special procedure where the surface of the cymbal is sandblasted to give more vintage warmth, dryness and a fantastic look. It has superhuman, modern abilities with that great vintage sound... Check it out - for me it's simply THE Ride."